After spotting that upside breakout from a long-term consolidation pattern on CAD/CHF, I’ve kept my eyes peeled for a chance to catch a long position on a quick pullback and I think I’ve got just the setup. I’m seeing a short-term rising trend line connecting the lows of price action since the last few days of August and I’m waiting for a correction to this support zone. It lines up with the 50% Fibonacci retracement of the latest swing low and high and has also served as a former resistance level. Stochastic is on the move down on this 1-hour time frame so buyers might be taking it easy and letting sellers take control for now. I’m eyeing a long entry right at the .7850 minor psychological mark with a stop loss below the .7700 major psychological handle. As for my profit target, I’m planning on aiming big since I did base this long idea on the large triangle breakout seen on the daily and weekly charts. In case you missed it, here’s a look at the CAD/CHF consolidation break. Now this chart pattern spans more than a thousand pips in height, so I’ll aim for at least half that size. After all, Canada’s fundamentals are looking pretty solid and might be enough to keep expectations of another BOC interest rate hike in play for the next few weeks. Apart from that, risk appetite seems to be returning to the financial markets these days on fading concerns about North Korea and Hurricanes Harvey and Irma. This is usually positive for the higher-yielding Loonie and bearish for the lower-yielding franc. Crude oil is also turning higher on speculations that the OPEC could go for another extension on its output deal. As for the Swiss franc, this week’s SNB decision could keep traders wary of potential currency intervention or the usual slew of jawboning remarks from Chairman Jordan. Even if the central bank refrains from adjusting monetary policy, the path of least resistance for the Swiss currency is typically to the downside unless risk aversion returns. 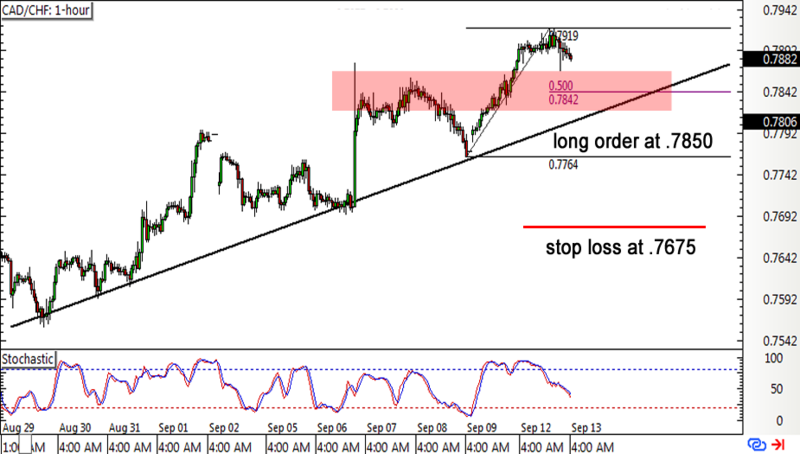 Long CAD/CHF at .7850, stop loss at .7675, profit target at .8275. I’ll risk 0.5% of my account on this play for a potential 2.43-to-1 R:R. What do you guys think? 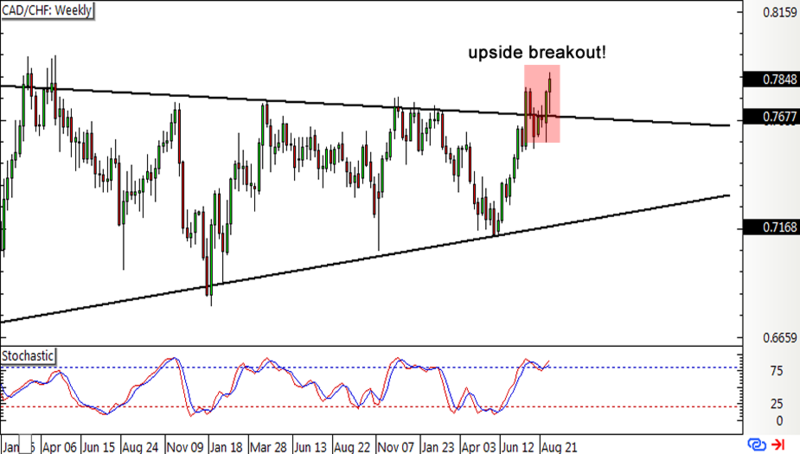 Breakout alert! I’ve got my one good eye locked on this long-term consolidation pattern on CAD/CHF, and the pair has just busted through the resistance.